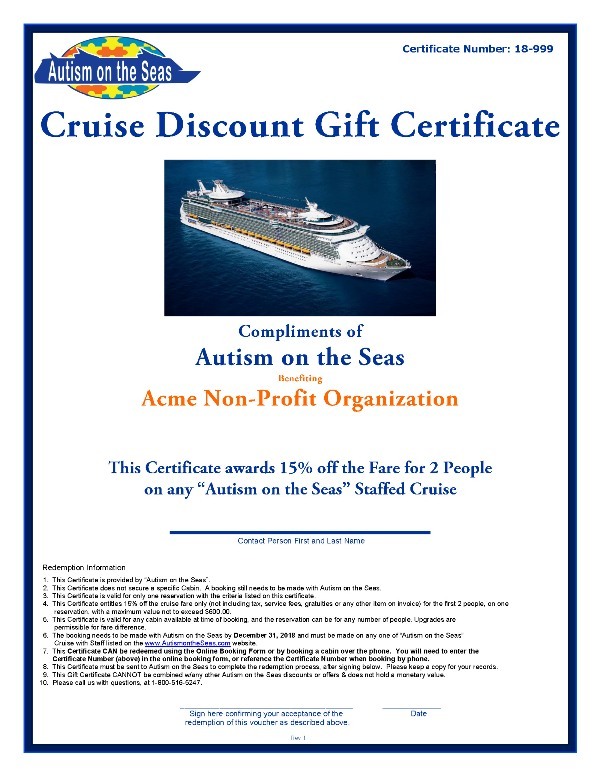 Autism on the Seas will offer a Gift Certificate (between 10% and 25%) for the first two people on a reservation, for any one of our Staff Assisted Cruises, for any qualifying non-profit organization. One donation per calendar year will be approved to each organization only, but might be limited to once every two years depending on the total number of donations provided in each year (to be determined upon each request). All donations are subject to be denied if our annual donation budget has been reached (to be determined upon each request). If you are denied, you may re-submit the following year. In order to qualify for the donation, the organization must be a not-for-profit, have a 501 c3, focused on autism and supply us with a Tax ID #. Each donated Gift Certificate must be included in an auction, raffle or fundraising event. Autism on the Seas needs to have its information on display (pictured to the right) during the event, and/or Autism on the Seas must be listed as a sponsor on event literature. How many people are expected at event?